The Alameda Gardens were established on the 14th April 1816. They were the brainchild of Lieutenant-Governor General Sir George Don, who planned the Alameda as part of more extensive reforms to improve living conditions on the Rock. Monuments and artefacts around the gardens remind us of their age and the Rock’s military and social history. By the end of the 19th Century, the Alameda had developed into a beautiful and well-known garden. This continued during the first half of the 20th Century, after which the gardens fell into a state of neglected. The Gibraltar Botanic Gardens were established in 1991 and the Alameda has been beautifully restored. It now holds thousands of plants from around the world. 64p stamp: The main entrance to the Alameda Gardens is marked by two Russian guns, which were taken during the Crimean War and brought to Gibraltar in 1858. The steps alongside these guns are known as the Heathfield Steps, because they lead up to the bust of the 1st Baron Heathfield, General George Augustus Eliott . 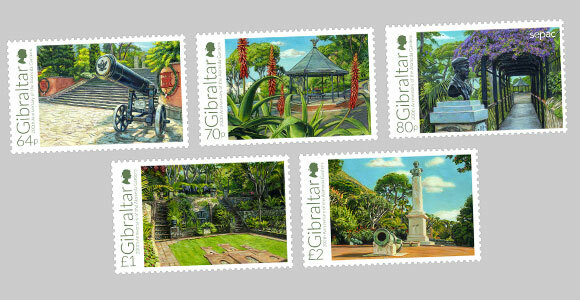 70p stamp: The Gibraltar Botanic Gardens specialise in succulent plants. Aloes, such as this lovely Aloe pseudorubroviolacea from Arabia, are a particular focus, with some 140 species present. The bandstand in the background is known as the Prince of Wales’ Summer House. 80p stamp: The old bridge over The Dell affords the prettiest vistas in the Alameda Gardens. The stunning Bougainvillea that grows over it is over a hundred years old. Parts of the Alameda Gardens and other gardens in and around Gibraltar were designed by Italian landscape gardener Giuseppe Codali, who is commemorated by a bust that lies at the entrance to the bridge. £1 stamp: The Dell or Italian Garden is without doubt the most attractive part of the Alameda Gardens. It was established in 1842, shortly after the Alameda’s inauguration. The Dell is an extremely popular wedding venue during the warmer months and, although access into The Dell itself is restricted, the views from the bridge that crosses over it display this subtropical garden at its very best. £2 stamp: The Alameda Gardens house some old monuments. These include a bust of General George Augustus Eliott, who was the Governor of Gibraltar during the Great Siege (1779-1783). The four howitzers that surround him date back to 1778. Some of the most characteristic elements of the gardens can be seen around the bust, including Candelabra Aloes, Stone Pines and Dragon Trees.